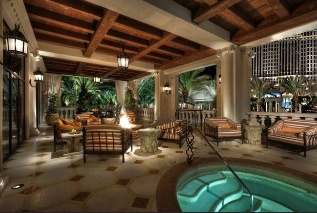 Caesars Palace Las Vegas is among the most prestigious resorts in the world. 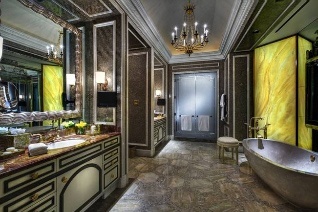 Caesars Palace Hotel offers a range of accommodations from Classic Guest Rooms to the exclusive Absolut Suite. Caesars Palace Las Vegas Casino offers 129,000 sq st of gaming space with all the popular Las Vegas table games and machines. Caesars Palace restaurants offer the finest cuisine Las Vegas offers served in opulent settings as well as casual poolside dining. Nightlife at Caesars Palace Las Vegas happens at one of several bars & lounges, and of course the premier hot spot in Las Vegas, PURE Nightclub . The Colosseum at Caesars Palace Las Vegas hosts superstar performers such as Celine Dion and Elton John. Caesars Palace Las Vegas also offers a superior host of amenities that includes the shopping destination, Forum Shops , and a 4.5 acre complex of pools. Caesars Palace has added three giant villas to the second floor of their unfinished Octavius Tower. Each one approaches 10,000 square feet, and follows a different design path. One is a Greek Place, one a Spanish home, and one a Parisian apartment. The idea behind them is to re-create the actual homes and vacation homes of those who can afford to be guests. As such, each villla is filled with collectibles and antiques, some faux and some authentic. Visitors can lounge by a grand Steinway piano and read a leather-bound copy of Great Expectations while poolgazing at the tanning bodies below. The classic and antique decor belies the technology underneath. Some of those old-fashioned cushy chairs will massage you to the beat of your iPod. Mirrors turn into TV screens. The toilet seat will raise when you apprach, and lower when you leave, meaning you will never have to actually touch one during your stay. Each abode cost around $15 million to build, and the price tage for a night's stay is $40,000. Caesars Palace Las Vegas Casino offers more than 129,000 sq ft of gaming floor that holds everything from high-limit slots to the most popular table games. Caesars Palace offers a variety of international cuisines including Chinese, Japanese, a sushi bar, noodle house, Pan-Asian, Italian and a 24 hour cafe restaurant. The Forum Shops at Caesars Palace is one of the premier shopping, dining and entertainment destinations in Las Vegas that includes over 160 boutiques and shops and 13 restaurants. The Appian Way Shops at Caesars Palace offers apparel, gifts, art and jewelry including Caesars logo items. The Neil Leifer Gallery at Caesars Palace displays this photographers most celebrated photographs, including epic shots of Mohammed Ali, Sectretariat winning the Kentucky Derby and President J.F.K. PURE Nightclub at Caesars Palace Las Vegas has been named the #1 Club in the country by E! Entertainment and the top Las Vegas Club by America Online, Las Vegas Review Journal, Las Vegas Weekly and Las Vegas City Life. Shadow Bar at Caesars Palace Las Vegas is a lounge and nightlife hotspot that features shadow dancers and exotic cocktails served by bottle-juggling bartenders. Seahorse Lounge at Caesars Palace Las Vegas is a hip nightspot with an underwater theme. Enjoy cocktails, specialty martinis and more than 20 champagnes surrounding a 1,700 gallon aquarium. Cleopatra's Barge is a floating lounge at Caesars Palace Las Vegas that showcases live music, DJs and a dance floor. Galleria Bar at Caesars Palace Las Vegas features a classic Las Vegas vibe where guests can enjoy drinks and coffee 24 hours a day. Spanish Steps at Caesars Palace Las Vegas is an outdoor bar that serves frozen fruit cocktails and food. Wedding services at Caesars Palace offer a superior level of attention and assistance in planning your perfect destination wedding. 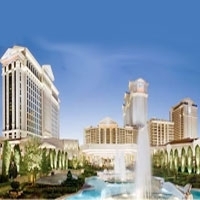 Caesars Palace Conference Center is a 240,000 sq ft complex of group and meeting facilities that includes an event center, ballrooms, meeting rooms, board rooms and other special venues.